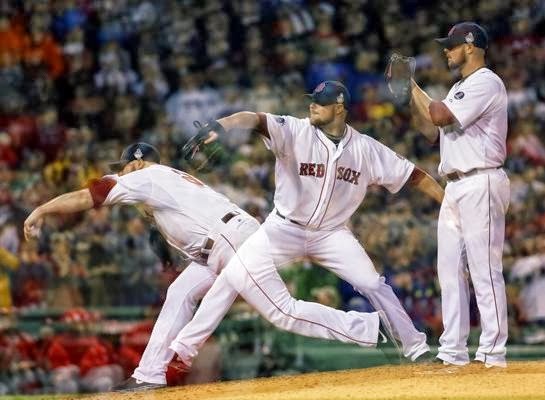 Jon Lester tossed 7.2 innings of shutout baseball and David Ortiz drove in three runs as the Red Sox grabbed Game One of the 2013 World Series 8-1 against the St. Louis Cardinals at Fenway Park. Lester (pictured) allowed just five hits and only one walk while striking out eight to earn the win. Junichi Tazawa and Ryan Dempster pitched the final 1.1 innings. The Red Sox scored three runs in the bottom of the first inning on a bases loaded double by Mike Napoli that scored Jacoby Ellsbury, Dustin Pedroia and David Ortiz. Boston added two more in the bottom of the second inning on a Pedroia single and an Ortiz sacrifice fly. Ortiz, in fact, just missed a grand slam on that play, robbed by Carlos Beltran who reached over the bullpen wall to rob Big Papi. Ortiz didn't miss in the bottom of the seventh inning on a two-run blast off Cardinals reliever Kevin Siegrist. Xander Bogaerts completed the Boston scoring with a sacrifice fly in the bottom of the eighth.